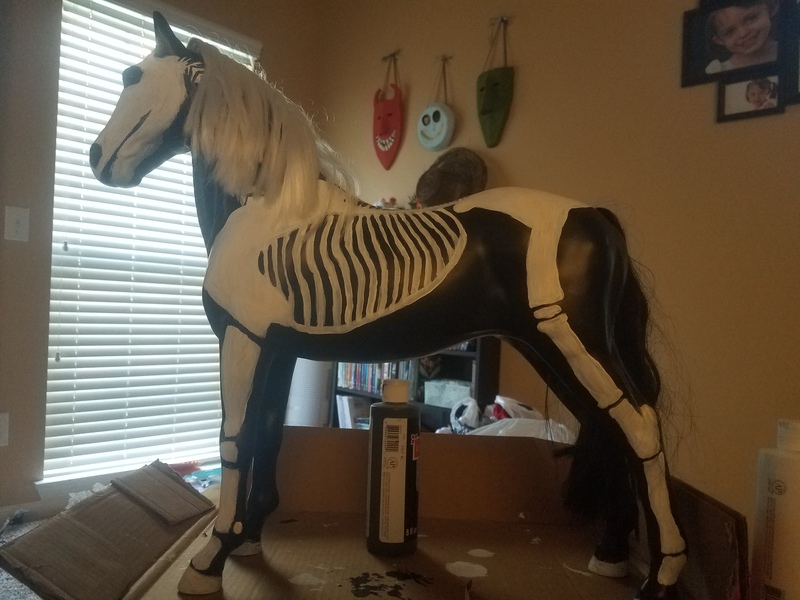 This entry was posted in DIY, How-to-Make Ideas, Props, Seasonal Decorating and tagged Animals, Halloween, Horse, Props, Quick and Easy, Reuse, Skeletons by thewritegirlforthejob. Bookmark the permalink. Vickie Hansen on Allenwood Road. Have you painted the carousel horse yet? Welcome to my site! It’s on my to-do-list for this weekend. I have several tutorials of my recent props I’ve made for 2018, but I haven’t even had the time to post. I’ve already made (minus the horse) about 10 new ones this year. I’m just finishing up Pennywise from the movie “IT”, today. Working with the horse is next. I’m gonna start putting them out this weekend and it should be completed by the first weekend in Oct. for sure! Thanks for your interest and if you ever have any crafts or tutorials you’d like to share, let me know and I’ll give you a guest post. Take care!